32-year old Wyoming man Andrew Sandness, whose face was devastated by a gunshot wound at the age of 21, recently underwent a near-total face transplant in Mayo Clinic’s Rochester campus in Minnesota. The surgery – which was performed by multidisciplinary team of surgeons, physicians and other health care professionals – involved restoring Sandness’ nose, upper and lower jaw, palate, teeth, cheeks and facial muscles with the help of a virtual surgical planning technology and 3D printing to optimise the aesthetic and functional outcomes. Dr Samir Mardini, who led the care team, said the operation spanned more than 50 hours and has dramatically improved the patient’s ability to chew, swallow, speak, breathe and smell. 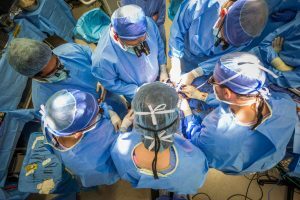 “Mayo Clinic has a long history of specialised teams of experts providing complex care to patients who need hope and healing,” Dr Mardini remarked. Mr Sandness said he was ‘absolutely amazed’ by the outcome of the surgery. “I am now able to chew and eat normal food, and the nerve sensation is slowly improving, too. My confidence has improved, and I’m feeling great ? and grateful,” he added.